Sit in your favorite chair and pedal away inches! Our pedal cycle exercise bike provides the same beneficial form of exercise, without the strain of uphill and downhill motion. This portable exercise bike firms calf and thigh muscles, trims tummies and strengthens backs, too. Helps improve circulation. Tubular steel is 11"H. Adjusts easily for stronger pedaling. Easy assembly. while im sitting in my chair or watching tv very comfortable. I got this package lickity split! I got it put together in about 8 minutes. I sit 12 hours at my job and this is helping to keep my back from hurting and to increase circulation. i bought this for a resident were i work at.she loves it, she said its makeing her legs stronger. I purchased this product for a family member who is a quadriplegic and confined to a wheelchair. He absolutely loves this equipment! While I was concerned he'd have to be prodded to use it with assistance, the opposite turned out to be true. He did not want to stop the exercises! We use it for his arms/shoulders and legs/feet. It is small, lightweight and easy to handle, and just right for him. It was also easy to put together. Thank you Miles Kimball for this great product! I love my pedal exerciser. I had a plastic one before this one. This one is much sturdier. I keep it under my computer desk, and use it while on the computer. I love this pedal Exercise bike. It is so easy to use. I multi-task while I use it, watch TV, knit, read, talk on the phone etc... It's wonderful. Exactly what I needed and the price is right! i bought it for one of my patients.she loves it. its helping her legs get stronger. Perfect exercise when you get out of breath exercising with COPD. Excellent relief for leg and stomach spasms due to an anxiety/panic disorder. Had knee replacement surgery and this product makes exercising the knee so much easier than PT! I have s stationary bike but was having problems getting up on it due to a hip injury so this product allows me continue to exercise. I was having to us a step stool to get up on the bike and the kicking it away so I could pedal, then slid off when I was finished. The portable bike is so much easier to use. Yes,I would buy this product again. To gift to someone. Great to use while looking at TV. Good results. This is a neat little device to use while watching TV or reading. Good for a person who does not do formal exercising. Because it is so lightweight, I put a heavy book in front of it on the floor to keep it in place. I like the fact that I can easily bring it to another room to use it. Can't do that with a treadmill! and you can't beat the price. I am supposed to do exercises after my knee surgery. Arthroscopy. I ordered this product because i had a knee replacement, my Dr. sugested a bycickle but i thought of this because i used to have oneand I don't know what happened to it. this is good exersize for people that can't stand to long to exersize & does the job good. i wont be without it now. Excellent item to have doesn't require much room. The directions were a bit complicated for assembly--but that gave my father something to do! The bike itself is great. I have a bum shoulder and this tool is great because it simulates some of what I do each week in physicial therapy. It's quiet, stays in place nicely on a tabletop, and has been quite convenient. For the price, it was well worth it! It slides around, so I put it against a wall and bring a chair in front; then it's great. Picture shows using it on a bare floor - FORGET THAT! Thisi was easy to assemble, although the instructions lost something in translation. It's not heavy duty, but sturdy enough for my use. It has a tendency to slide, so I put something heavy in front of it. This is good for someone who needs to build up strength in their legs, or burn a few calories. Don't expect it to give the workout that a stationary bike would, however. But, you can't beat the price. very god for non exercisers! Due to placement of holes for cotter keys, pedal shaft slides from side to side about 1/2 inch. OK for the price. Good Deal. Miles Kimball on the other hand have alot to be desired with their customer service. Purchased this product because my Dad at age 90 had retired from his job and he found himself sitting alot so when he started complaining about the strength in his legs this item was purchased and he uses it at least twice a day for 10 minutes and it has noticeably improved his steadiness when he is up and walking around. My husband is bed ridden and he can sit up in bed with it in front of him and pedal with his hands to strengthen his arms. The only thing we had to change was cutting down the screws that would catch. His Therapist used one, but now he can use it when he's not here. I am A Home Care Occupational Therapist. I can use this device on a wide range of clients, and get excellent results. It is easy to use and very affordable so that my patients can purchase one for home use without breaking the bank. This product was for my mother. Keeps her active at 85. The only problem it is slippery when place on bare floors. I bought this exerciser to work my shoulder area. I broke my shoulder area & use an exerciser similar to this at physical therapy. This helps keep my shoulder loosened on the days I don't have PT. Not as effective as the PT one but it's better than nothing. Glad I have. I bought this on sale and it is well worth the price. I do use it everyday, I put it under my desk and there very little noise. I am happy I got it. Its worth it, but you get what you pay for. I really love using this product at work while at my desk I can discretely work out, the only issue is the instruction could of been more detail, the screws loosen up when or when I do not use the equipment (weird) and its not sturdy so don't paddle too fast but overall it gets the job done so I would recommend the product. The price is great! This is a great way to exercise. It's compact and light weight. Even my 92yr old mom can work it with no problem. She sits most of her day watching TV, now she can exercise a little without having to leave her bedroom or even leave the house. I'll use it too! Great product. This is a perfect way to exercise for someone with bad knees. Even if all you can do is petal with your arms, you are still getting some type of exercise. You can use it in the comfort of your own home and at your own pace. peddles can be removed and it works well in the hands. Very pleased with cost and function. this is excellant for someone with limited space,and is great for privacy. light weight and easy to move around. Helped my husband after his stroke. I just wish it had been heavier. It tended to crawl away. I PURCHASED THIS PRODUCT FOR A 83 YEAR OLD FRIEND WHO WAS BASICALLY CHAIR-BOUND SOTHAT USING IT WOULD INCREASE BLOOD CIRCULATION IN HER LEGS. UNFORTUNATELY SHE DIED BEFORE SHE EVER DOT TO USE IT. "Mom" uses it everyday. She is 90 years old and pedals every day for 1/2 hour. She even puts it up on the table and pedals with her hands to loosen up her arms. Good for people that need to exercise during inclement weather. Wobbly. Incomplete. Box was Damaged. I think this could work but, there were a few snags. The parcel came damaged and open. It's missing one velcro strap and so there's no reason to use those. It did not come with directions either. It is wobbly like crazy and will not tighten up. Stays put when pedaling forward. Easy to use and fairly easy to put together. Tighten all the nuts as much as you can. It is rather flimsy due to it being so light weight but once both feet are in place it stays put unless pedaling backward (which is also good for you). I use the product because I am disabled and can't use regular recumbent cycles. I need help with circulation and exercising my legs. This machine is a great idea. The price was just right considering it is flimsy and the screws are very small so they fall out while in use. After using it for about 10 min. I felt my heart rate rise therefore it couldn't be all that bad. You get what you pay for. The setup was not difficult. Instructions were easy to follow. I was missing one part. Short one nut was not worth telephoning to get a replacement. The concept is good, but..would have to sit in a high chair, in order to pedal, NOT an ordinary chair, as specified. The unit scoots on the floor, and cannot keep it in place. I was looking for something I could do while seated due to some physical limitations and this does the trick. I was surprised that it came completely unassembled as there was no mention of "assembly required" in the catalog. Once assembled it was necessary to modify the base with some slip-proof material to keep it from sliding away while being used. But, once it was secure in place, it does a great job and is easy to use. Too light weight - will not stay firm while trying to use it. Jumps all over the place. I suffer from fibromyalgia which makes my muscles tight, especially in my legs. This product works pretty well for keeping my muscles loose and flexible and keeps them from cramping or I can work out cramps when I get them. The bushing materials inside going around the pedals are very cheap plastic and wear out quickly making it hard and noisy to use. I purchased this originally in June and the metal arm was cracked and bent by the 4th of July. After I replaced the new one also broke in the same place within a month. This time the metal bar snapped in half. I have only been using it 3 times a week for about a half hour each time. This was a gift to my daughter. She is extremely small and still has problems keeping the peddle bike in one place. It has a tendency to walk. The legs need to have a little more weight to them. We have put weights on the back legs to keep it in one place.v It is perfect for the arms though. It is portable and handy to use with a chair, but it is so light that it scoots across the floor when using it. Maybe weighting down with 10 pounds of sugar, etc will make it more usable. Got this for my wife who is using it for rehab. I would not buy it again. It is inexpensive and you get what you pay for. Its not sturdy and when using it slides across the floor. Straps for your feet are to narrow feet don't fit in them. It is to light. I bought this to exercise my knee after total knee replacement, but it really doesn't challenge or strengthen much. Inexpensive, and it will give you a chance to see if you really enjoy this type of exercise. It is flimsy and will scoot across the floor if you don't put a rubber mat underneath. Pressure screw does not tighten very well. It must be assembled with confusing directions with very tiny screws, nuts and bolts requiring a tiny wrench. But....I really enjoyed pedaling and will now purchase a much sturdier one. The product is so lightweight that it moves every time that you pedal. Bought for my mom but was useless didn't stay stable on the floor while pedaling. Being too light probably doesn't help it. I got this to try to get more active. With a desk job and no time to get to the gym I wanted something I could put under my desk at work and get in 10-15 minutes throughout the day. This machine is so flimsy even after getting a non skid mat I couldn't use it because it would keep pushing away from me. The directions were awful, I couldn't figure out what to do with the small washers, the pins were hard to secure once you figured out how since they don't tell you and stick out so I was afraid of cutting or scratching myself while using it, the pedal straps get twisted up around the bar and hinder the rotation, the resistance screw didn't work at all no matter how much I tightened it. Don't waste your money. I found another machine at the sports store for $50 that was heavier and minimal assembly that works great. Another case of you get what you pay for I guess. I'm recovering from knee replacement and this was supposed to be an interim method before a stationery bike, but it didn't perform as I planned so is unusable. I liked the cycle very much but the problem is you cannot keep it in one spot.It keeps moving forward as you pedal. The base needs to be anchored down with weight. I was wanting to use this to strengthen my arms and legs that are weak from fibromyalgia but the instructions are not good and I am missing the leg straps. Spend a little bit more and get something sturdier. I wanted to use this at the office under my desk, it won't even pedal good , the metal gets so hot around joints that it could burn you. I would return this if it weren't to much trouble. Lightweight, needs to have a frame that keeps it from moving on the floor....I will build one. The best part: It's OK for cardio, if you pedal fast enough. That's about it. The worst part: After about 10 minutes of use, the nuts come loose and the screws fall out. We have to put them back in just to use it and it interrupts the session. Even set at the highest tension, it is very loose and easy to pedal. The instructions that came with the machine were badly translated, and my mother had a hard time putting it together as none of the components were labeled. It was missing a nut and the caps were stuck inside the rods. When we finally put it together and used it, it kept sliding across the floor. I am looking into some super glue to hold the nuts on and some WD40 for the horrible screeching of the washers. I would NOT recommend this item for anyone. Pay the extra 30$ and get a good quality pedal machine. I got what I paid for, I understand that, but it literally started to break the first time I used it. The middle part got very hot after only a few minutes of use and the pedal assembly started to warp and bend under the heat. If you're using this for anything but a slow pedal for knee therapy or something, it won't last long at all. I hoped to find a pedal cycle like this at an inexpensive price that I could use to work out on. But this one is so flimsy it won't even stay still for you to pedal. The old saying that you get what you pay for is definitely true with this product. Don't waste your money on this one. It doesn't stay in place while pedaling. Its cheaply made. I wish I could send it back for a refund. The screws to put this together are so tiny and they just do not stay in place. So, as you are trying to work out, it is falling apart. The little nut at the top which holds the knob in that controls the resistance is glued on very poorly and already broke off after 3 uses. What a waste of my money! This was cheap but I didn't expect it to break within a month. One of the pedals just bent and is about to snap off. I couldn't even assemble this one. 2 weeks after using it,the knob broke off. The insides that the knob holds down keeps moving back and forth. The screw/nuts keep falling off. Not a good product at all. I would never buy this again. It should be removed from the catalog. 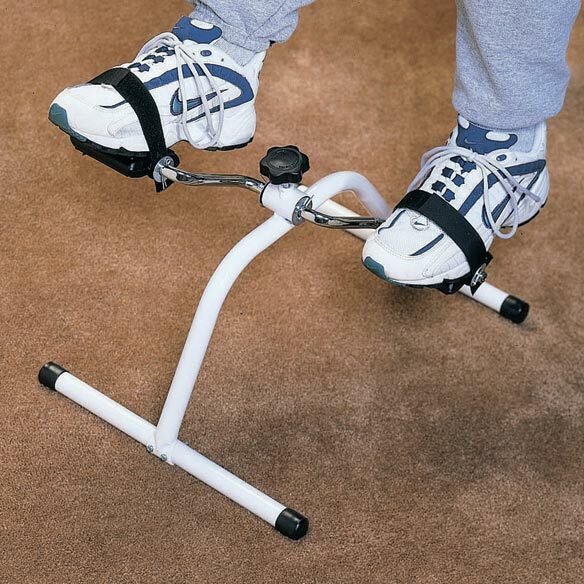 I bought the pedal exerciser for my Grandfather as a rehabilitation exercise to use at home because he had surgery a few weeks ago. He was only able to use the product a few times before it broke in the middle. The product is easy to setup and use but it is very flimsy. Bought this to exercise shoulders after surgery.This was difficult to put together and had many sharp edges that could have damaged my carpet and the table I planned to use it on. Recommend spending your money on a higher quality product. I feel badly because I purchased two of these....one for myself and one for a friend. nuts keep loosening and machine tips easily. I had one purchased about six years ago that was much sturdier. IT basically broke the first time I used it.. Cheap design, and I will never purchase from this site again. Determined not to lose money, and to get fit, I put it back together with gorilla glue, and electrical tape. It will probably still break.. extremely dissatisfied. I used this for two weeks and the pedal arm broke. The metal sheared right off at the screw. The machine was not subject to any extraordinary weight or abuse. Just plain, normal use. Two weeks and it's off to the trash. Don't buy this! The pins that came with this to attach the pedals were usless. They wouldn't hold the pedals on. Couldn't figure out how they could possible work. Can not use this product, since the pedals don't stay on. not the quality i expected. would not buy again. Bought because dr wont let me ride bike. The bike wont stay still, and your feet wont stay on petals. There should be some non-slip rubber tips added so the thing won't slide all over the carpet. It is not very useful when it slides away. I was excited because this was inexpensive and I would be able to use it at home instead of going to the gym. I put it together and immediately had problems...it won't stay still on any type of flooring (it moves when you pedal), the pedals are jerky and not sturdy. A complete waste of my money and shipping. Very diappointed. Horrible....the pedals broke from the unit in less than ten turns. The "weld" was more like chewing gum. And I didn't have the "brake" tightened. I purchased the product to help with my wife's therapy from a knee replacement operation. Obviously not worth the "one" star I had to give it. The idea is good but the product was not made well. It would wabble and move away from me. The cycler fell apart while I was using it. This does not sit still very well. It wants to "walk" across the carpet when I use it. Product to light. Fasteners fall out. Flimsy construction. Unable to use as fasteners keft coming out. Waste of money. My doctor suggested I use this as I just had a knee replacement. It is worthless. Your telephone operator was not very nice. I have been a customer of yours for many years and this is the FIRST TIME I have complained about any product and I told her that but she was not nice. I have been unable to understand the instructions. Ugh!!! I have been unable to put this item together. I bought two , one for a gift and one for myself. It is so confusing. I have it halfway assembled and have stopped. Couldn't put it together...I got more exercise throwing it out the back door...Don't waste your time and money. It is very dificult to use the nuts keep comming off the screws I have to stop after 2 0r 3 min. and fix it. Not a good product. I had bilateral knee replacement a few months ago, and I bought this, pedal cycle, so I can work out at work, while sitting.The product is cheaply made. I broke 2 cycles already.[...] but the product is poor quality.They should sell a better quality product, especially one that is being used on a daily basis. This was a waste of my money! After about two day's use it broke. Even for those couple of days, I had to keep thigten up the nuts. A complete waste of my money! Excercise for my immobile wife. I have legs I need to exercise and it is hard walking. Dr. recommended I get this so as I sit I can pedal. Can use while watching the news. I purchased it for my brother-in-law. because it was need, least cost, and easy to order. To use in my first grade classroom. Used in therapy and was good for me! My vein doctor asked me to get one, to improve my circulation. On days that I can't or don't walk with my walking group, this is something I can do inside. I wanted to try it out and the price was good. I'm way too sedentary in my old age. This is my first exercise equipment purchase. Probably because it looks like the easiest to begin with. To try a new exercise. It keeps trying to fall apart though. To exercise while sitting for my circulation and leg pain. Post right hip replacement for Rehab purposes. i weigh 405 is this product strong enough for my size sitting down ? BEST ANSWER: it is light duty, I weigh 220 and got it to recover from knee replacement surgery and after a few uses I donated it. It is very light. can this be put on a table & peddle with hands? BEST ANSWER: Thank you for your question. We find that this will work as well as for the feet.We hope this information will be of help to you. Can you pedal in reverse? BEST ANSWER: Thank you for your question. Yes you are able to pedal this in reverse. We hope this information will be of help to you.